Here’s the Hamilton House in 1906, with the Hamilton House Bar downstairs (well, up the stairs, technically) and the rooming house above. There seems to have been a slight change of detail, as in 1905 the Daily World referred to ‘Temperance house’, ‘F. J. Hamilton, Prop’. The new level wood plank sidewalk was in front, although the street wasn’t quite as level. The hotel itself was also new – there’s nothing showing on the 1903 insurance map, and the first appearance in the Street Directory was in 1906 – The Hamilton: Francis J Hamilton, prop. We’ve met Francis – or Frank through his ownership of an East Side building. The 1905 building permit describes him as ‘of Calgary’, and identifies the architect as ‘Mr. McLean, of Vancouver’. That would be C B McLean, an architect who practiced for only a few years in the city. 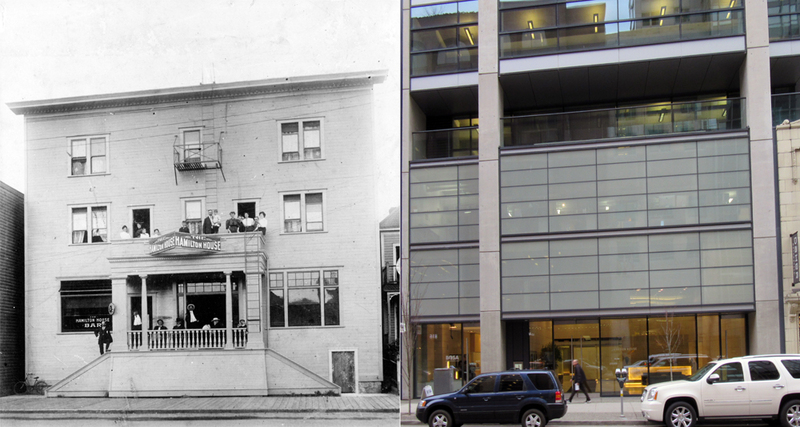 Unlike Mr Hamilton, we can trace Mr Fortin back to at least 1896 in the city, and in 1904 he owned the Leland Hotel on West Hastings where he carried out some alterations. He only kept our building for a year – by 1908 it has been renamed again as the Fairmont Hotel, run by James Pope. Mr. Fortin in 1909 was running the Café Fortin in the Fortin Block on West Cordova where Frederick Fortin was the manager of the Pool Room at the Fortin Hotel. This hotel retained the Fairmont name after that for several years, although the proprietors changed as we’ve seen with many of the city’s hotels and rooming houses. In 1910 it was run by Flanagan and Smedley, and they kept it all the way to 1916. In 1910, presumably when they bought it, they carried out $5,000 of alterations, designed by G M Baly and built by T E Young. In 1918 it was Mr Flanagan on his own running the hotel, and in 1919 it had become the Invermay Lodge run by Mrs A Blackburn. It was still the Invermay in 1924, but the Invermay Hotel run by E W Arnott with J LaChance.